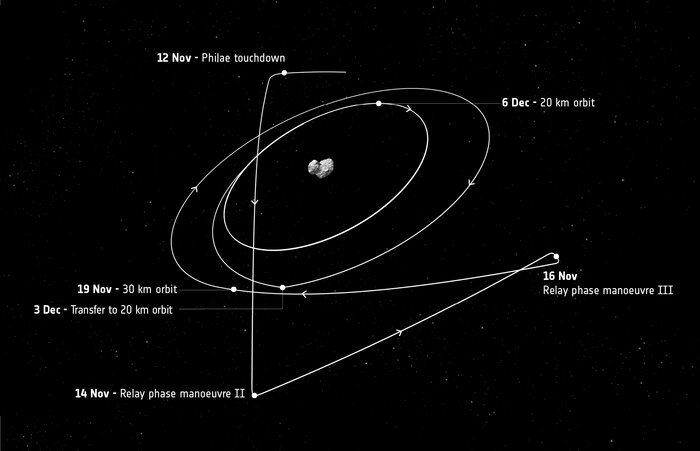 November 19, 2014 – With the Philae lander’s mission complete, Rosetta will now continue its own extraordinary exploration, orbiting Comet 67P/Churymov–Gerasimenko during the coming year as the enigmatic body arcs ever closer to our Sun. Last week, ESA’s Rosetta spacecraft delivered its Philae lander to the surface of the comet for a dramatic touchdown. The lander’s planned mission ended after about 64 hours when its batteries ran out, but not before it delivered a full set of results that are now being analysed by scientists across Europe. Rosetta’s own mission is far from over and the spacecraft remains in excellent condition, with all of its systems and instruments performing as expected. This includes the Southwest Research Insitute’s Alice instrument, built in Boulder, Colorado. The ultraviolet wavelengths Alice observes contain unique information about the composition of the comet’s atmosphere and the properties of its surface. The science-gathering phase will take Rosetta into next year as the comet moves towards the Sun, passing perihelion, or closest approach, on 13 August, at 186 million kilometers from the Sun. On November 16, the flight control team moved from the large Main Control Room at ESA’s Space Operations Centre in Darmstadt, Germany, where critical operations during landing were performed, to a smaller Dedicated Control Room, from where the team normally flies the craft. Since then, Rosetta has performed a series of manoeuvres, using its thrusters to begin optimising its orbit around the comet for the 11 scientific instruments. “Additional burns planned for today, 22 and 26 November will further adjust the orbit to bring it up to about 30 km above the comet,” said Sylvain Lodiot, Spacecraft Operations Manager. From next week, Rosetta’s orbit will be selected and planned based on the needs of the scientific sensors. After arrival on August 6, the orbit was designed to meet the lander’s needs. On December 3, the craft will move down to a height of 20 km for about 10 days, after which it will return to 30 km. With the landing performed, all future trajectories are designed purely with science as the driver, explained Laurence O’Rourke and Michael Küppers at the Rosetta Science Operations Centre near Madrid, Spain. Planning the science orbits involves two different trajectories: ‘preferred’ and ‘high-activity’. While the intention is always to fly the preferred path, Rosetta will move to the high-activity trajectory in the event the comet becomes too active as it heats up. “This will allow science operations to continue besides the initial impact on science planning that such a move would entail,” said Küppers. When solar heat activates the frozen gases on and below the surface, outflowing gas and dust particles will create an atmosphere around the nucleus, known as the coma. Rosetta will become the first spacecraft to witness at close quarters the development of a comet’s coma and the subsequent tail streaming for millions of kilometers into space. 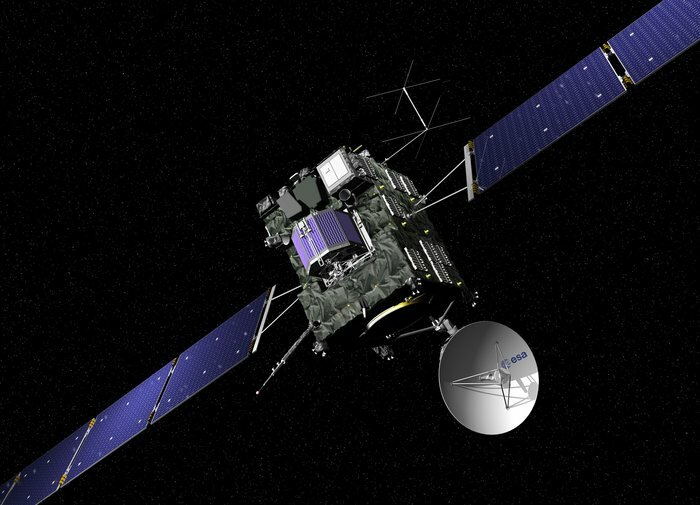 Rosetta will then have to stay further from the comet to avoid the coma affecting its orbit. In addition, as the comet nears the Sun, illumination on its surface is expected to increase. This may provide sufficient sunlight for the DLR-operated Philae lander, now in hibernation, to reactivate, although this is far from certain. Early next year, Rosetta will be switched into a mode that allows it to listen periodically for beacon signals from the surface.